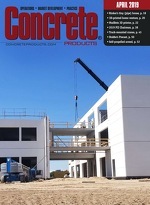 Concrete Products - Your Leading Source for Concrete News. The Associated General Contractors of America is the first signature sponsor of Construction Safety Week. The May 6-10 event will see AGC members and peers across the U.S. and Canada stage site standdowns and related activities to promote best safety practices throughout the project delivery cycle. Source: American Concrete Pavement Association, Rosemont, Ill.
To recognize the recently proclaimed Concrete Industry Day, American Concrete Pavement Association-Colorado/Wyoming Chapter, American Concrete Pipe Association and Colorado Ready Mixed Concrete Association members will host legislators and staff for a BBQ picnic lunch on the Colorado State Capitol grounds in downtown Denver. Ronnie Pruitt has been named president of ready mixed and aggregate producer U.S. Concrete, maintaining his chief operating officer title but taking over many corporate functions that support the company's operational business units. He arrived in 2015 as COO and senior vice president after tours of duty in Martin Marietta Materials and Texas Industries management.